J.C. Penney cut 43,000 workers last year as the department store chain tries to overhaul its image. 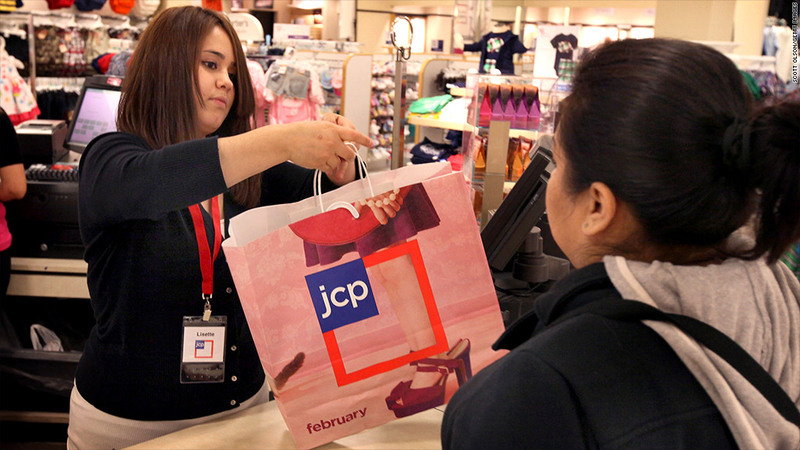 J.C. Penney cut 27% of its workforce last year as the retailer struggled to turn itself around. The department store chain slashed 43,000 jobs, according to its annual report filed with the Securities and Exchange Commission Wednesday. J.C. Penney reported a total of 116,000 full-time and part-time workers at the end of its fiscal year that ended February, down from 159,000 workers last year. While it's not a surprise that J.C. Penney has had a tough time lately, the sharp decline in the number of workers was much higher than management has reported. Earlier this month, J.C. Penney CEO Ron Johnson said in a New York court that the company had let go of 19,000 workers since he came on board in Nov. 2011. J.C. Penney (JCP) did not immediately respond to requests for comment on the discrepancy, or the news, which was first reported by The New York Post. After struggling to increase sales in recent years, the 111-year-old retail chain has been fighting to overhaul its image since Johnson joined the company from Apple (AAPL). Johnson has implemented a series of new initiatives such as redesigning the store, changing its clearance strategy and even offering free haircuts for kids. So far, the changes haven't paid off. Last month, the J.C. Penney reported a fourth-quarter loss of $427 million and badly missed analyst expectations. Sales were down 28% from a year earlier. Investors haven't been impressed with Johnson's efforts. Shares have tumbled 56% from a year earlier, and nearly 18% so far this year. The stock is was down 0.6% in early trading Thursday.